Function to tenderly dry the seeds of various plants, grown mainly in small lots. The figure stipulated for each type indicates the number of crates placed in the drying shaft. 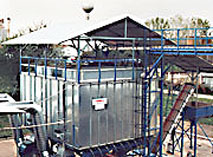 As the crates are units performing an independent drying function, several crops or product types can be treated simultaneously. The minimum quantity which can be loaded into the drier is 1.6 tons (of wheat). The required free height inside a building or at least on a covered site is minimum 7 meters. The equipment in manufactured in three versions but, upon request, a size more appropriate to local needs may also be ordered.